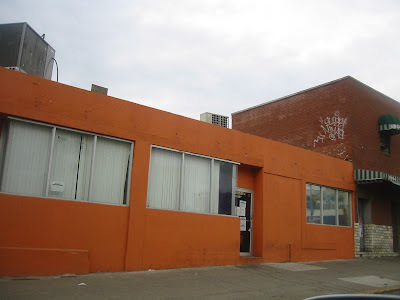 These guys were busy taking down the Tropico sign from the orange creamsicle walls of this club at 39th and 4th. Curious, I looked it up figuring something must have occurred to prompt this sort of behavior. Sure enough, there is a Full Vacate order on the building. 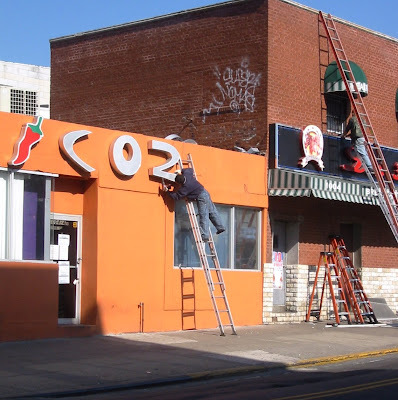 According to the order, the "cabaret" operating here was for 106 people, but there was "inadequate means of egress also "no" valid COFO "no" valid certificate of operation "no" fire alarm. No adequate fire supression system." Sounds like a recipe for disasters repeated. And repeated. It took a while for the violations to come to light, but once the Vacate notices went up, it didn't take long to make Tropico disappear.